Indiegogo and Kickstarter. Many of you know how I feel about these sites (not a fan), but once in a while, there’s some decently exciting stuff on there. One product that currently has my attention, and seems likely to actually launch, is Clarity Speaker. While there are no shortage of portable speakers on the market, Clarity offers a few nifty features. First, it has a 7″ multi-touch display (HD resolution) and runs Android 6.0+ (Marshmallow). 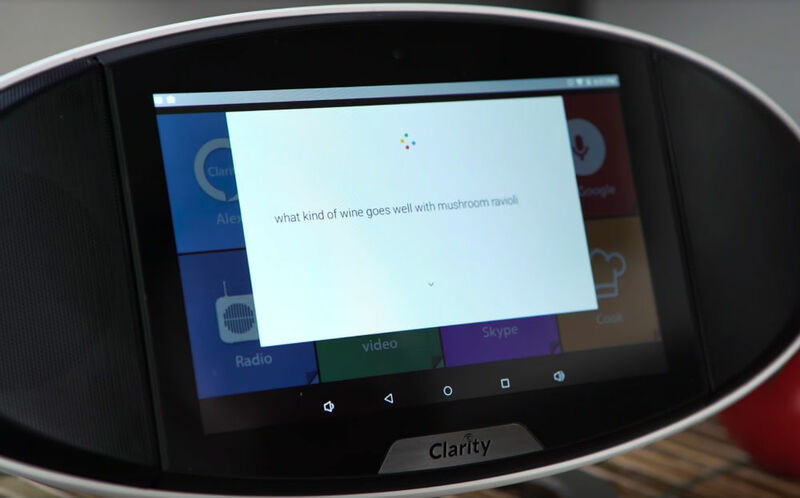 Because it runs Android, the makers are also able to offer access to Google’s “Ok Google” voice assistance (not fully fledged Google Assistant), as well as Amazon Alexa. Think of it like an Android tablet in a speaker dock or Amazon Echo with a big touchscreen. With the digital assistance onboard, you’ll be able to control your smart thermostat and lights, get weather updates, ask about recipes, and all of the other goodies associated with “Ok Google” and Amazon Echo. With the added touchscreen, it becomes way more of a hub for the entire setup, complete with access to Google Play for app downloads. Specs wise, it features a quad-core processor, two 5-watt speakers for bumping tunes, a 2MP camera, 16GB of onboard storage plus expandable storage, near and far field mic capabilities, as well as a rechargeable 1600mAh battery for portability. The Clarity Speaker is said to ship in June, priced at just $199. However, an early bird price of $149 is available through to April 30 via Indiegogo. For $149, this all seems like a solid buy. As detailed on Indiegogo, the company set out for $50,000 in funding, but is currently sitting at over $220K. Please, crowdfunding Jesus, let this one be real.